Unit Tests can be used using various techniques within Decisions designer studio. Unit Test's can be created using a flow and a rule to test data as it passes through. AdvancedUnit Test's	have advantages that help to quickly and accurately check the data being passed through and provide a clear picture of what you may be looking to test. This document demonstrates advanced techniques of using Unit Test	utility in Decisions designer . Prerequisite:	To start with Unit Test	utility please go through Unit Tests Overview (Simple Flow) document first. This document demonstrates the advantages of using Unit Tests	on Composite Data Types , Step Simulation Options , and Running Unit Test Rules before any step in the Flow . Begin by starting from the flow designer. 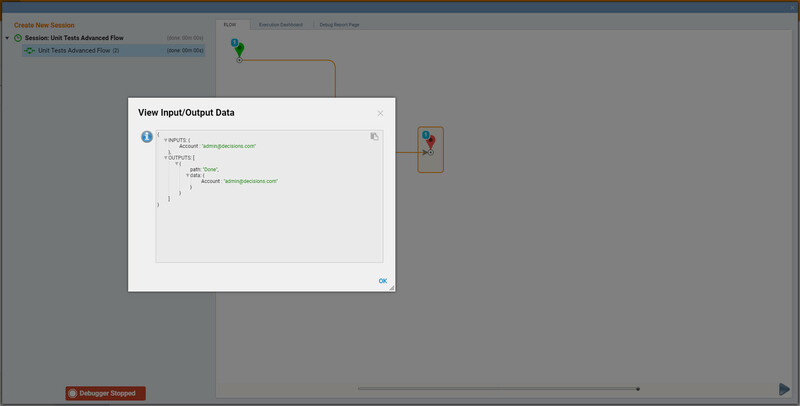 Select theStart Step	in the Flow designer and choose Show Editor	in the Properties Tab to add a new flow Input Data. In the Data Definitions Editor create a dataName	and define theType	. 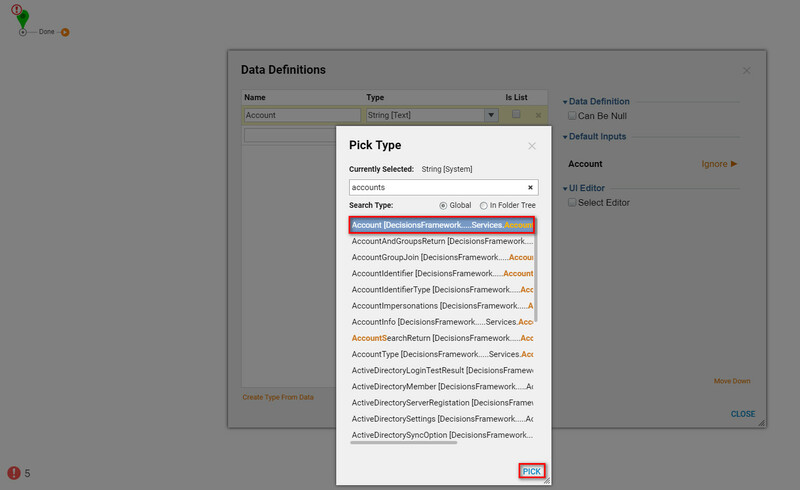 For this example search for accounts	in the search bar and select Account [DecisonsFramework]. Next, connect the Start Step	to the End Step	in the Flow and select Debug	located on the top of the flow designer on the action panel to open up a Unit Test. In the debugger	add a New Unit Test	by selecting Add New	next to Unit Tests. 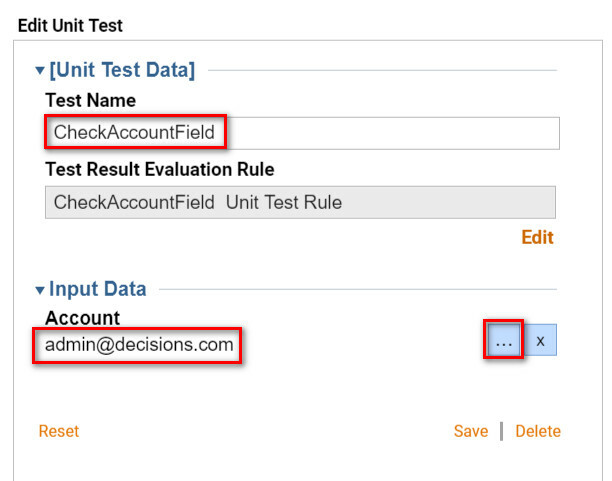 Give the Unit Test aName	(CheckAccountField) and select the Input Data settings button on the right under Input Data. Next, Pick or Define an existing Account	(admin@decisoins.com) add a description and select Define	to save a close. Add a second Unit Test	and choose a different Input Data. This Unit Test is named CheckEmailTest	and uses Account: user@decisions.com	. 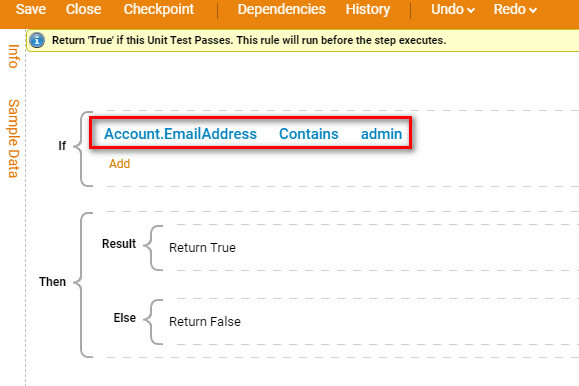 Edit each Unit Test and create a rule that checks for Account EmailAddress Contains Admin. 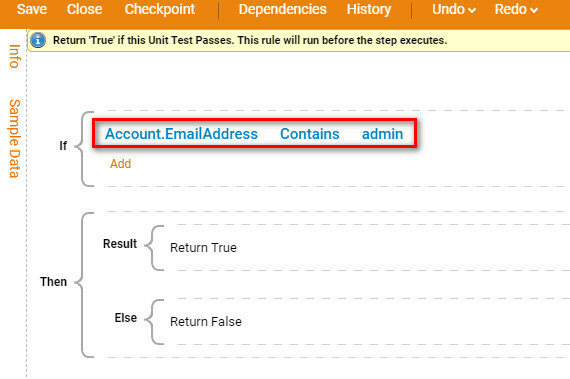 The example sets up a rule that checks for admin in the account email address. 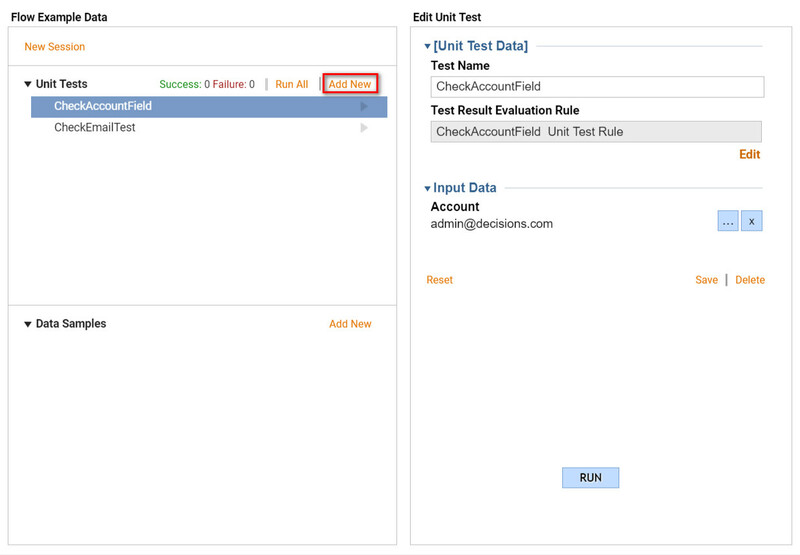 Select Edit	under the Test Result Evaluation Rule	to add a rule to eachUnit Test. In the Rule designer	write a rule that can evaluate any desirable field of theComposite Data Type. 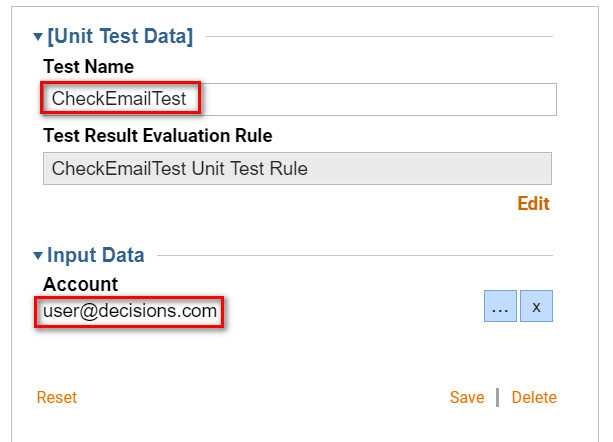 This rule will use the pickEmail Address field	from the Account	input as the example. 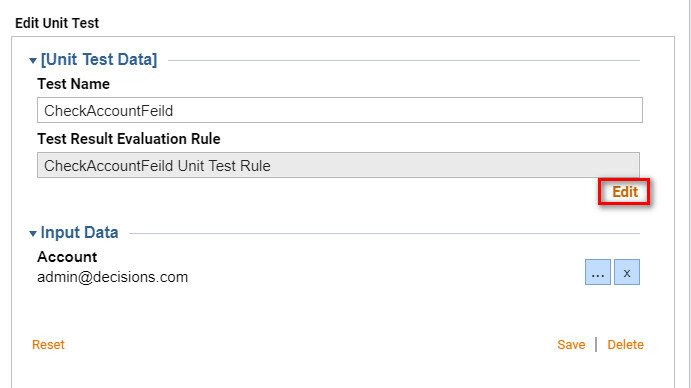 The Rule states: If the Account.EmailAddress Contains admin	(if the Unit test passes the rule will evaluate true if the Unit Test fails the rule will evaluate false). Select Run	All	to run all Unit Test's created. Next, Save,	close the Unit Test and navigate back to the Flow designer. Select theEnd Step	and under Data	and Output	selectShow Editor. 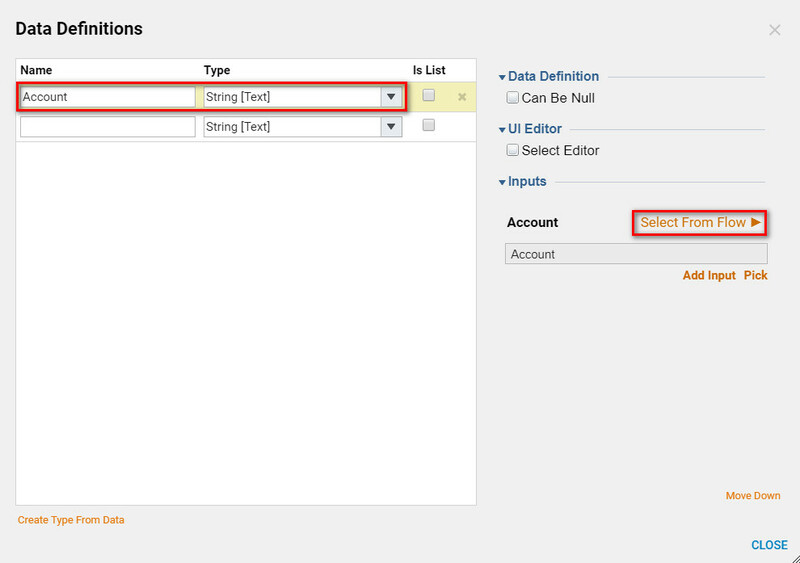 Create a new data definition called**(Account)**	and then choose String as the Type**. 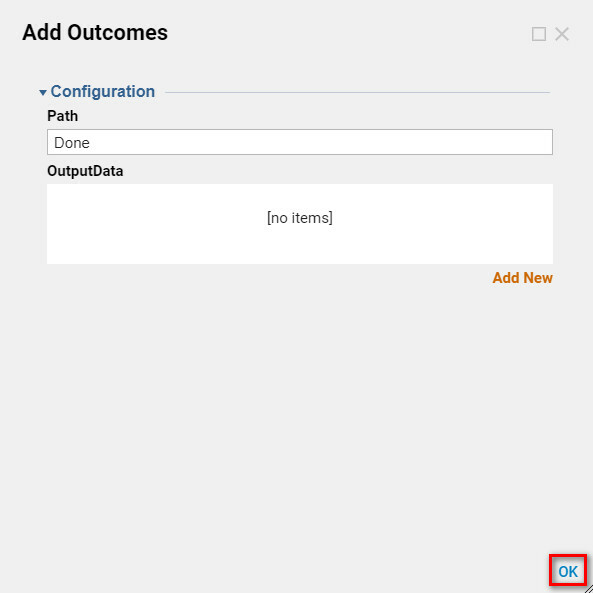 **	Under Inputs next toAccount	choose Select From Flow	and then pick Account. In the Flow designer, selectDebug	. Next, to Unit Tests select Run All	to run all Unit Tests. 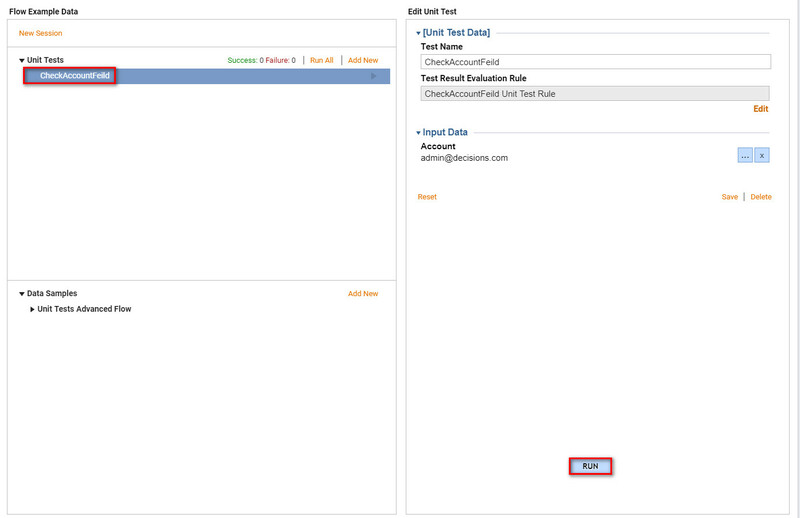 The results of the Unit Tests will display under Under Unit Tests, displaying which test evaluated as true or false. This completes the example of setting up Unit Tests for Composite Data Types. 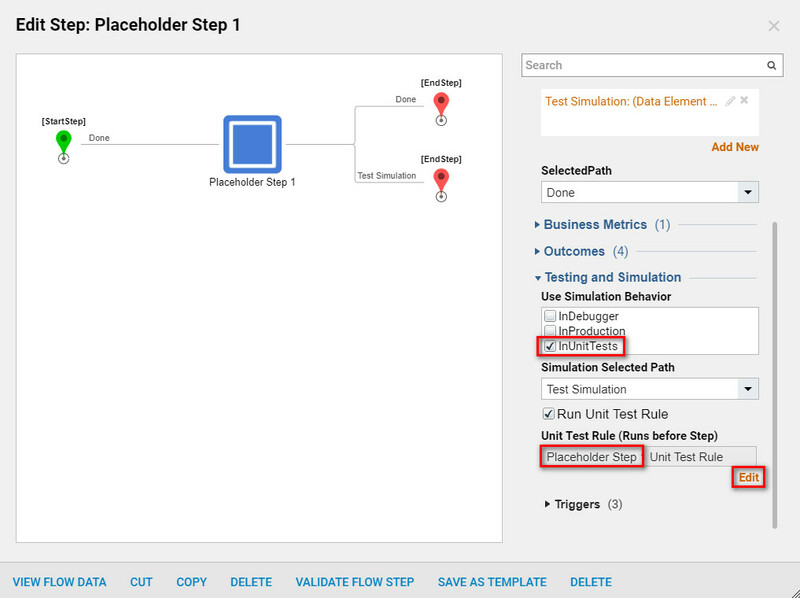 In the Flow navigate to thePlaceholder Step	and in theProperties Tab Add Simulation Selected Paths	. Under Outcome Definition	and under Outcomes	select Add New	to Add a new outcome/pathway. Define the Outcome definitions in the editor. 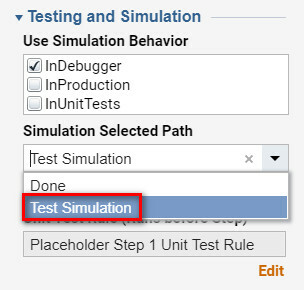 Running a Unit Test	on a specified step is called Step Simulation. Step Simulation can be specified on a step or on a specific direction in a flow. Start with the Unit Test Flow,	add a Placeholder Step	and connect the pathways. Each option that is checked under simulation behavior will run the flow with that behavior and on the selected pathway. 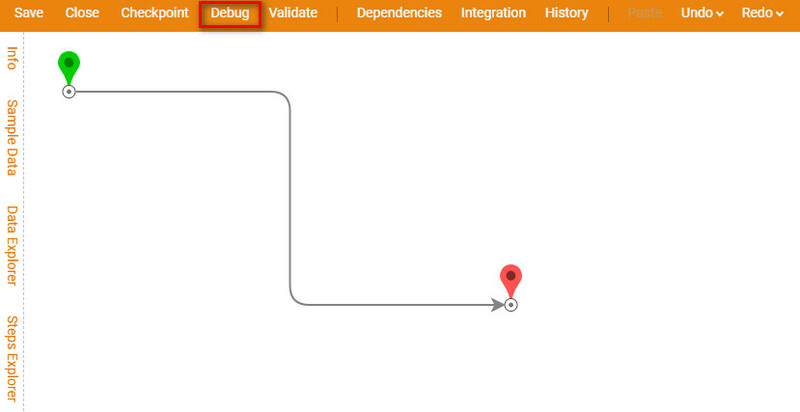 InDebugger: Run the test in the debugger on the selected pathway. InProduction: Run the test at Production on the selected pathway. InUnit Tests: Run the Unit Tests in the flow on the selected pathway. 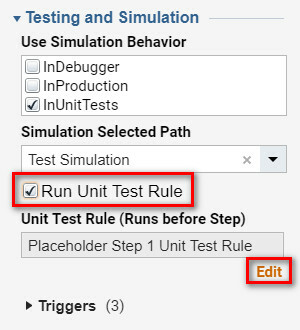 Choose the path in the drop down to run a Unit Test or a Unit Test Rule. Checking the box runs aUnit Test Rule	on a specific Test. The Unit Test Rule can be created by selecting edit	underneath the specified Step. The Unit Test Rule runs before the step. Begin in the Unit Test	Flow	then, selectRun Unit Test Rule. Under Unit Test Rule	selectEdit	to edit the rule. In the Flow, Name the test and pick Account. Next, build the Rule that will run on thePlaceholder Step. In the Flow designer select Debug	to open up theUnit Test	options. Under Unit Tests on the left chooseCheckAccoutFeild	and then Run	the Unit Test. If the Unit Test evaluates False the flow will stop in the debugger. If the Unit test evaluates True the flow will continue to deploy in the debugger. This completes the example for advanced Unit Testing.